Okay, updating content and node, because in previous description I said everything that you don't care about when looking for new maps. All FFA items present, only one QD, HB and YA, map is more closed, so if enemy has QD you can escape with little luck. Map has a lot of verticallity, and only some places require RI or RL jump, and 1 place has good GL jump, so everything else is accesable only with walking and jumping. This map is pretty awesome and didn't got the attention that deserved. I love the geometry. The details are nice too, the layout on the other side still feels a little complicated and the ilumination feels unfinished. 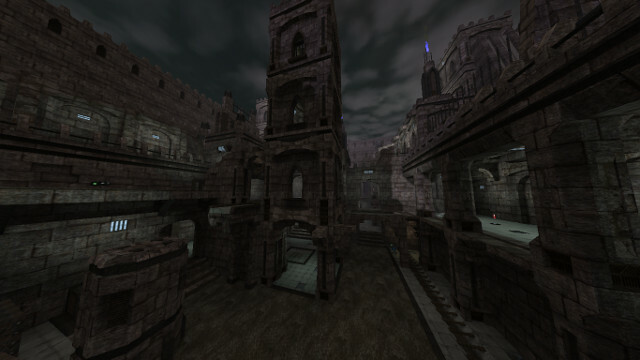 It's supossed to be dark, but i don't feel that vibe, especially outside of the higher tower in the center. Seems like something is missing there, my suggestions for the lights are adding new kind of contrast, like creating more shadows or lights coming through different sources, like slits, semi-open windows, doors, small holes in the floor etc. Still, leaving those things aside (Wich are personal aesthetic appreciations) the map is pretty nice, playable, detailed... That's why there is not too much to say about it. My vote is 8/10 Great map.